Lancasters make aviation history Jump to media player Two Lancaster bombers have made aviation history by flying together on the south coast for their first public display as a pair. Thousands set to attend air show Jump to media player Tens of thousands of visitors are expected to attend the Eastbourne air show over the next four days. Lancaster bombers fly in tandem Jump to media player The last two remaining airworthy Lancaster bombers fly together over Lincolnshire. Lancasters in first tandem flight Jump to media player Two World War Two Lancaster bombers fly together for the first time in 50 years. Veterans return to WW2 air base Jump to media player Veterans from World War Two return to the air base where thousands of raids over Nazi Germany were launched. BBMF prepares for Canadian Lancaster Jump to media player Final preparations are under way to welcome one of only two flying Lancaster bombers to the UK, when it arrives from Canada. During the Second World War, Lincolnshire was home to thousands of crew from Bomber Command. Today, the first turf was cut for a memorial centre which will tell the stories of those involved in the conflict. 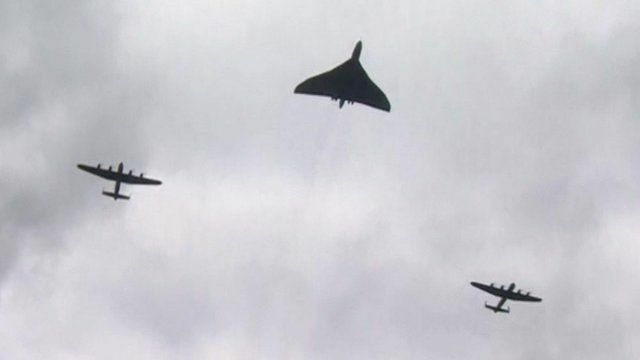 To mark the event, the final two airworthy Lancasters flew in formation, along with the last flying Vulcan bomber, over the memorial site at Canwick Hill.